Home  blog  Bug! This colourful platform game originally début on Sega’s classic Saturn games console. A year later Windows users were treated to the cool little insects antics. Bug isn’t your typical platform game hero, he’s a hotshot in Hollywood and in this game, he’s just scored his biggest break ever. In the amazingly scripted movie Bug’s agent has signed him up for, he must rescue his girlfriend from the evil Queen Cadavra. To do this, he’ll have to run and jump his way through several levels of platform mayhem (apparently before they signed Bug! it was going to be a Bee movie). So, the plot may be kind of threadbare but the game itself is still a lot of fun. Children will love the bright and colourful graphics and fun sound effects and adults old enough to remember the game the first time around will no doubt relish the chance to play again. Bug was one of the earliest examples of a fully 3D platform game and so it has historical interest too. Bug should install without any major issues on modern systems. If you find that you cannot start the autorun program normally, you may need to explore the CD and run the “Setup95” program manually yourself. When prompted to choose an installation type, choose “Maximum Installation”. By default the game will install itself to C:\SEGA\BUG! If you change this directory remember that the game needs to be able to write to the directory it is installed to, so you may need to change permissions on the folder for other users. If you’ve never used the compatibility options for a game before, there’s a full tutorial here on how to use them. These settings will get us as far as the intro, but then the game will crash saying it is incompatible with high resolution screens. The problem is that Bug! likes to change between full screen and windowed mode while it starts up, this confuses the compatibility tools in Windows which think that the game has finished running and switch the desktop back to its usual resolution and colour depth. To work around this problem we’re going to need a tool called QRes. Confusingly there seem to be not only multiple versions of this program on the internet but also multiple authors who have written similar programs with the same name. The version we’re going to be using to get Bug! to work is by AKSoftware and can be downloaded from this page Edit – seems that site is down, grab the file from this link instead (link broken? let me know here). The file is downloaded as a zipped folder. Once it is downloaded, open the zip folder and copy the Qres.exe executable file into the Bug! Installation directory. What we need to do next is create a batch file. This file will firstly change the screen resolution to 640×480 with 256 colours. It will then shut down Windows Explorer (to prevent that from interfering with the game), launch Bug! and wait for the game to play. When the game is finished, pressing a key will restore Windows Explorer and your original screen resolution. What you need to do is edit the last line. Instead of 1920 and 1080 you need to substitute the values of your desktop resolution. If you don’t know these values, the easiest way to find them is by opening the screen resolution settings window. You can do this in Windows Vista by following this tutorial or in Windows 7 by following this tutorial. So for instance if your regular desktop resolution is listed as 1024×768 in Windows, you’d replace ‘1920’ in the batch file with ‘1024’ and 1080 with ‘768’. Save the file once you have finished editing it. Just one more thing to check now before starting the game. Bug! uses CD audio tracks for music and requires that the CD be left in the drive during game play. If your computer has more than one optical drive, you must use the drive that has the first drive letter. So for instance if you have a DVD drive on drive letter E: and a DVD-Writer on drive F:, the Bug! CD-ROM must be placed in the DVD drive (letter E:). Once you’ve verified this, start the game by double clicking on the “LaunchBUG” batch file. If you followed all the steps above, the game should now start. Bug! must be played full screen on a modern PC, so press the F4 key as soon as the game starts to switch into full screen mode. If you don’t play in full screen, expect the colours in the game to be incorrect. Just press F4 any time the game decides to switch into Window mode again (it may do this while it’s starting up) and the colours should then be corrected. SPIT: Press the S Key. DUCK: Press the D Key. ZAP: Press the A Key. Bug! can be moved with either the analogue stick or the d-pad. The actions are assigned to the buttons on the right, duck is also available on the right trigger for quick and easy access. Enter is assigned to the pads Start button, allowing the game to be quickly started without having to reach for the keyboard. Finally, since Bug! 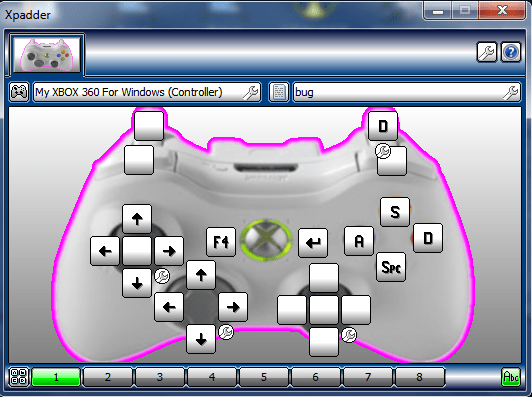 likes to start in windowed mode, pressing the back button on the 360 controller will automatically toggle between window and full screen mode. Just for fun we made a little video of Bug! being played on our Windows 7 machine, a quad core system with a GTX580 graphics card. The games chunky pixel graphics have dated, but still have a certain charm and at twice the resolution of the Sega Saturn original this is the definitive way to enjoy this classic title. Know how to get this game working in Windows 8 or 10? Help the community by submitting a comment and letting us know! HELP!!! when i got to the batch it messed up my pc screen its on disorted and cant fix it please help me :(!!! At that point, make sure the Bug window is selected and press F4, you should now be good to go. If the game decides to go window mode again, hit F4 again. The CD install doesn’t seem to work for me. I’m getting “Can’t open file E:\WIN95\BUG!.EXE”. Any help? Just explore the CD in Windows Explorer and run the “Setup95” program manually. I’ve tried searching online about inf files but it seems complicated, i’m wondering if you can help please. Probably just a faulty version. 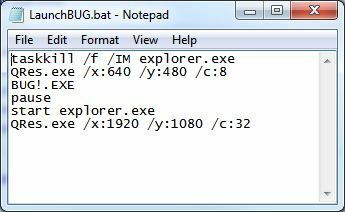 You can open the BUG!.INF file in notepad and check that the directory is correct though. Try installing the game to a shorter path and one with no spaces. (e.g c:\Games\Bug). Well clearly that’s not correct, enter the path to your BUG directory, or reinstall the game. Qres isn’t actually doing anything. It doesn’t support the game. You know that right? Compatibility mode alone is what is making the game work in full screen mode. Can confirm the game did not work without the QRes step on our Windows 7 PC. Yes, file path is the same as the address in the Windows Explorer address bar. See http://www.top-windows-tutorials.com/file-paths.html I can’t really give much more help since we only support original versions. the game installs in spanish with no option to change language. i dont understand all settings when i have launched the game what do i do? Sorry, that doesn’t happen on our version, can’t help you there. Thanks for helping me get the game running. Is it possible to save the game? I see that there are checkpoints and the option to continue if you lose your lives, but I don’t want to play through the entire game in one sitting. To be honest I’m not sure, it’s a very old game so it might not be possible. I just made it work on WINDOWS 8, I first tried every single way it occured to me but I only got it working on black and white, but the solution is kind of weird and pretty much random. I’m sure I tried that but I will give it another go. I did this and the game boots up, but it crashes after the first few company logos. The VS debugger is giving me “privileged instruction”. Not sure if this helps. tente procurar em sites de pesquisa, o que é ilegal. se bem que nem sei se existe ainda para venda… tente o google, aqui só explica como rodá-lo em sistemas mais recentes. hey, where is the download link?? I couldn’t find. i was having the same problem as simon and your suggestion worked ! i can now play the game. I got the game to work beautifully where graphics were concerned, but there is no music. I am using the original game disc, I only have one DVD drive (D:), and the game is installed to a short file path. Bug uses CD-Audio, are you able to play normal audio CDs through your computer? There is a tool that supposedly fixes a lot of audio CD problems in older games, looking into it is on my to-do list. It is called “_inmm”. It is by a Japanese programmer. Most people are downloading a ripped version of the game with no CD audio tracks. You can rip the audio tracks from your legally obtained copy of the PC version or your legally obtained Sega Saturn version in MP3 format (using Windows Media Player). Place those in a directory and use _inmm to modify the executable so that it will use the MP3s. I’ve done this on tons of older games. As I said, it does not appear that Qres and the bat file do anything at all. According to the command line prompt they simply fail in the background as you launch the game and play it. They are not necessary. Windows XP SP2 mode also seems to work as well as Windows 9X mode. If you don’t use the QRes step, Windows resets the desktop resolution when the game goes into windowed mode, this causes issues on the machines we tested. I stand corrected. It appears that Qres does make it a little more stable. Have you had any luck with Bug Too! This exact fix also fixed the color issue with Manx_TT in Windows 7. By normal audio CD’s, do you mean just an ordinary MP3 music CD or something else? What took was it that supposedly fixed this problem? Hmm.. Grabbed an old Pink Floyd disc and put it in (D:). I noted that the URL bar does say “Audio CD” and that the files are ‘.cda’ extensions – Audio CD tracks. So they are for sure not MP3’s. So, it does look like the CD drive is working fine regarding audio CD’s.. But for some reason with the original BUG disc in the drive, there is no audio in the game. and can you play the Bug game CD in Windows Media Player too, in the same fashion? This is a common problem when running Windows 9X games in NT based operating systems. You will have to modify the executable to play MP3s ripped from your legally obtained game, stored in your game directory. Well, if I click on the CD drive it just loads the installer. I right-clicked to see if Windows Media Player would show up – but it isn’t showing up as one of the options. I assume this is because Windows Media Player doesn’t have the MIDI decoder, codecs, or whatever it needs to properly play these .SND files. The music player for these files is supposed to be built into the game. I tried running the game with the CD ejected, and it says to please insert the game CD. So it is definitely recognizing that the CD is in the drive when I run it. It’s just not using/playing/recognizing the music files..
Open Windows Media Player first and THEN insert the Bug CD, you should then see the audio tracks and be able to play them if there’s nothing wrong with the CD (unlikely, but possible). Strange because the CD is in excellent condition with no visible scratches..
After seeing this, I obtained ISO’s for this game from two different sources and burned them onto separate CD-R’s. Unfortunately, I still got the same result using these newly created CD’s. I also downloaded a CD drive emulator that allows you to mount ISO’s to a virtual CD drive that shows up in My Computer. Tried mounting those ISO’s one at a time to see if that would work, and sure enough, although it detected the game “disk”, the game still wouldn’t play the music. You have the original store-bought CD too? That’s odd I am sure the game used cd-audio tracks. Using a CD-ROM emulator like Daemon or Alcohol was the next thing I Was going to suggest. If you do that however, you have to make sure that the drive letter of your virtual CD-ROM is BEFORE your physical one. Also I’d make my own CD image from a store bought original rather than trust a dodgy internet downloaded one. I used Daemon. Also, I used device manager to disable my physical CD drive (freeing up D: for assignment) – then assigned (D:) to the virtual drive. Of course BUG detected the ISO as the game disk, but it did not play the music as usual. For whatever reason your PCs not reading mixed mode CDs correctly. Please note you cannot browse to CD audio tracks when using mixed-mode CD-ROMS, all you will ever see in Explorer is the data track. What was the file size of the Bug CD image you downloaded/made? It should be around 700 Megabytes. Some of the budget Sega rereleases from Expert Software are actually missing their red book CD audio for some reason. I’ve got a copy of Sonic R like that. Professionally pressed disc, legit publisher. Physically lacks anything after the first track. I have windows 7 32 bit version. should bug still play? As Bug! doesn’t work on Windows 8, should i bother to try with a Vista one ? Thanks (great site btw) ! Well it works on Windows 7, so I don’t see why it wouldn’t on Vista. Windows Vista, Windows 7, Windows 8, and Windows 10 share most of the same code. I would be very surprised if it didn’t work in Windows 8. It is more likely you are not following the instructions or have an incomplete or damaged game. There’s a fair bit changed between those versions of Windows, particularly with relation to legacy DirectDraw emulation. Windows 10 is incompatible (tried it on the weekend, though need to try the ACT fixes suggested by Iceman when I have more time). I’ve not re-tested Windows 8 as I don’t have it any more. Tried the fixes, gets further but still no dice sadly. There really isn’t much of a difference. I know MS engineers that helped design WIndows (more specifically Windows Phone 8, which shares the same NT kernel). It is all based on the NTFS Server Kernel. There was a more dramatic difference–under the hood–between Server 2003 and Server 2008 R2 than between Windows 7 and Windows 10. Legacy Direct Draw emulation–if it was indeed changed–is a very small aspect of the entire operating system. It is more likely that some of the new “features” no one asked for are blocking this legacy support that is still extant in the code of the OS. In this respect it was changed quite significantly, well, significantly as far as running old games was concerned. Many titles were affected and need special fixes in Windows 8. Notice the “disable desktop compositing” option is gone in Windows 8 and 10 too. 1. Install the game as mentioned above. 1. Intro videos play small and duplicated twice at the top of the screen. 2. Pressing F4 (to swap back to windowed mode to access menus to Load a game (for example) crashes the game, as it says it won’t run in high resolution. Not sure if there’s an ACT fix to FORCE Windows to stay 640×480 even when coming back out of an app, feel free to play around some more BuckoA51! I should add: when the game starts (in a window), press F4 or use the menu to select Full Screen, or it’ll go back to a tiny window when the title appears and close, saying it’s too high resolution! Additional: whilst you shouldn’t/can’t press F4 to revert to a window, pressing Ctrl+L WILL allow you to load a saved game, and it then goes back into the game, without closing about being in high resolution! Good effort, did you try forcing Windows down into 640×480 mode using Qres or whatever your preferred method is? Nope, just used ACT off the back of noticing that using 640×480, 8bit colour and NOT using Win95 compatibility = crash when reaching opening video, but if I DID use Win95 compatibility the screen stayed black but the game played (sound etc), so I figured if I go through the Win95 compatibility flags in ACT, something may cause it to work AND have graphics, which luckily, it did! Hmm Bug Too! is a different beast… more on that one tomorrow. Installing it is slightly annoying, then it says it can’t initialize the video mode, whatever you try. The same manual install method on Win98 virtual machine works fine. Okay Bug Too! I got working, using dgVoodoo wrapper, but it’s not perfect as the CD audio loops every few seconds, pausing the game, so there might be more fixes that help this one. Update: replace the DXPrimaryEmulation + -DisableMaxWindowedMode with the ACT flag NoGDIHWAcceleration, it’s more compatible and better! I got this game running on Windows 8 with the compatibility tool you’ve mentioned, but there’s a problem at the intro, when the game pass the “Realtime associates, inc” logo, the game crashes. I tried to use the batch file and also pressed F4 but nothing happened, it still crashes. Sorry, we don’t allow links to pirated software on this site. And where exactly is link for downloading? It’s not available for download, you should check eBay etc if you need a copy. Any chance on an updated tutorial on how to get this to work on windows 10… I can get it to launch but it launches windowed fullscreen however if i ctrl alt del then click task manager there is a small minimized window titled bug in the corner if i click that it becomes true fullscreen. I would like to get true fullscreen when i click f4 not a windowed fullscreen. I don’t think it does work on 10, I never got it working on anything past 7. The only issue now is changing the diffculty from hard to easy in the game’s options, it seems to be unchangable. I am so emailing sega & begging them to rerelease this game, or at least port it to xbox live & playstation network! Incidentally I run windows 7 Ultimate, 32 bit, Pack 1. Where can I download the game ?? I can’t find the download link. Nowhere that I know of sorry, check eBay etc for a disc. my copy of the game isn’t physical and every time i open the game a window pops up saying “unknown problem loading the specified device driver”. and the game plays without music even with the music setting turned on! what do i do?! Your game is a pirate copy unfortunately, we can’t support those. What are your thoughts on getting it to work in a 98 virtual machine?